We have seen "Classifications of gears" and "Gear terminology" in our previous post, where we have discussed the types of gear and various terms used in gear mechanism. Today we will be concentrated on a very important term in respect of gears and that is Pressure angle in gearing mechanism. You might be thinking, why we should read this article? Let me tell you, Pressure angle is an angle at which driving gear will apply the normal force on the driven gear or we can say that power transmission will be done at this angle. 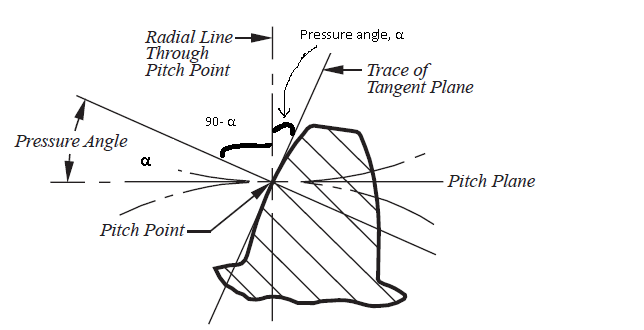 Pressure angle is basically defined as angle formed between a radial line to pitch point and a tangent line over tooth profile at pitch point. 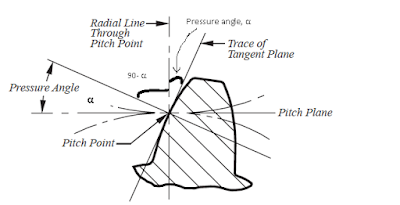 From figure, we can also define pressure angle as the angle formed between tangent line to pitch circle i.e. pitch line and a normal line to the tooth profile at pitch point. As we have mentioned above, at pressure angle driving gear will apply a normal force (FN) to the driven gear. There will be two components of this normal force (FN) and these components of normal force will be FN Cos α and FN Sin α.
Tangential component i.e. FN Cos α will help in torque transmission and as we are looking here that this tangential component is a function of cosine hence if pressure angle will be smaller, torque transmission will be higher. But we must note it down that if we are selecting smaller pressure angle then gear tooth will be weaker. Earlier gear manufacturers were considering 14.50 pressure angle, but these days pressure angle of 200 is mostly preferred and used by gear manufacturers. We have discussed here the concept and importance of pressure angle in gears. Let us go ahead with new post in "Engineering maintenance category". Please share your feedback and suggestions by giving your comments. How do hydraulic servo valve work?